(Nanowerk News) Investigating mysterious data in ultracold gases of rubidium atoms, scientists at the Joint Quantum Institute of the National Institute of Standards and Technology (NIST) and the University of Maryland and their collaborators have found that properly tuned radio-frequency waves can influence how much the atoms attract or repel one another, opening up new ways to control their interactions. As the authors report in an upcoming issue of Physical Review A ("Radiofrequency Dressing of Multiple Feshbach Resonances"), the radio-frequency (RF) radiation could serve as a second "knob," in addition to the more traditionally used magnetic fields, for controlling how atoms in an ultracold gas interact. 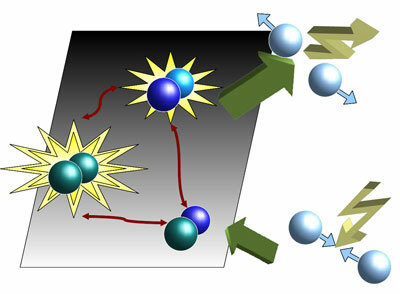 Just as it is easier to improve reception on a home radio by both electronically tuning the frequency on the receiver and mechanically moving the antenna, having two independent knobs for influencing the interactions in atomic gases could produce richer and more exotic arrangements of ultracold atoms than ever before.